Delivered in collaboration with Loughborough Junction Action Group and supported by Tree Shepherd. On the Small Business Day, support local by attending our colourful market, featuring the best of independent businesses, start-ups and artists. From craft to vintage, from cosmetics to jewellery it will be the perfect spot to grab a Christmas present for family and friends. In addition we will be providing the finest entertainment including local steel pan band Divine Steel, seasonal snacks and hot beverages. PureGoodness Natural Hair and Skincare, Kuya Organics, CrazyCoolSexy Fashion, Clarkshaws Microbrewery, Tilly’s Pretty Petals & Paintings, Lady Rosalind Greeting Cards, Art Prints, Local Ceramics and Glass Artists, Katiico Handcrafted Jewellery, Buy Rice Back Bags, Argan Oil, Mulana hand embroidered cards and gifts, Leather Belts and Accessories, Purple Palm Yoga Mat Bags and more. 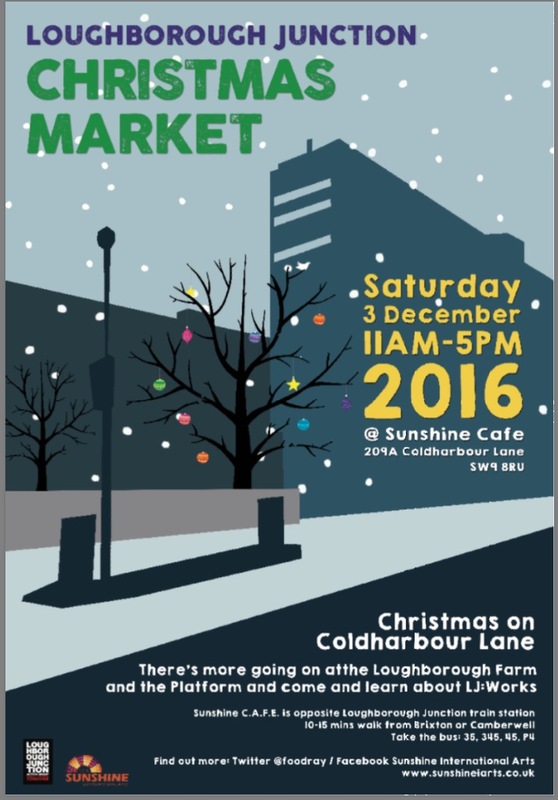 Loughborough Farm will be here with homemade cakes, farm chutneys, freshly picked vegetables and natural skincare. And watch our neighbour and glass artist Patrick blow Christmas baubles! 6ft tables cost £20, small round 3ft table £12. If you’d like to share a table with a fellow stallholder for half the price, just let us know and we will try to accommodate. Come and get involved on Saturday 3th December in the Sunshine C.A.F.E. –bake us a cake, run the tea stand or volunteer a few hours of your time to help us set up – all help will be greatly appreciated.